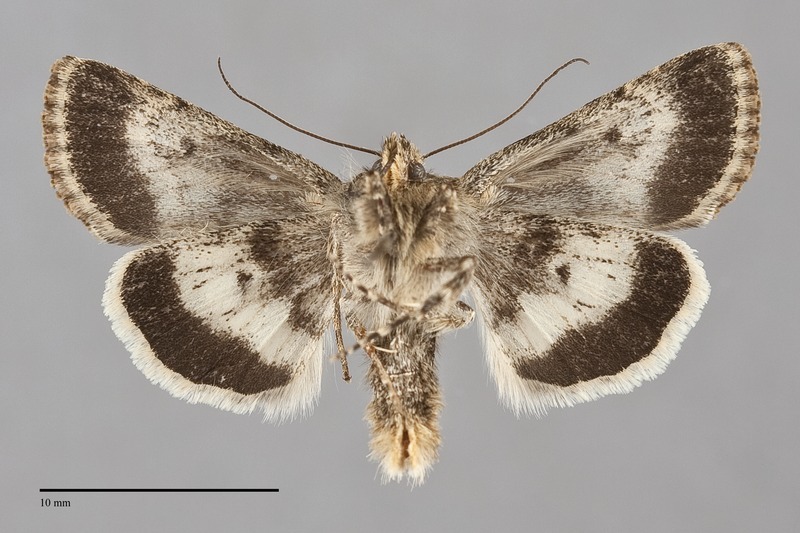 Sympistis pudorata is a small moth (FW length 13 - 14 mm) with a mottled gray-brown forewing and banded off-white and dark gray hindwing with a white fringe that flies near timberline in northern Washington and British Columbia. The forewing is slightly variable in color, ranging from smooth to powdery and gray-brown to brown. The median area is darkest and the medial subterminal area is the lightest area. The cell is filled with darker gray-brown in some specimens. The basal, antemedial, and postmedial lines are black, single. The antemedial line is slightly irregular and oriented slightly oblique to the wing axis. The postmedial line is scalloped between veins, excurved near the cell and oblique toward the base below the cell. The postmedial line is pale brown, irregular, and preceded by darker gray. A dark gray median line is usually evident across the wing. The terminal line is a series of dark gray spots. The fringe is gray-brown, very weakly checkered with light and dark. The orbicular and reniform spots are less conspicuous than the lines, outlined in gray, and filled with light gray-brown peripherally and the darker ground color centrally. The orbicular spot is oval and the reniform is kidney-shaped. No claviform spot is evident. The hindwing ground color is brownish off-white, with heavy gray suffusion at the base and gray veins. The dark gray discal spot is partially obscured by the basal suffusion. The marginal band is dark gray to black. The fringe is tricolored with a yellow base, gray median line, and white edge. The head and thorax match the forewing ground. The male antenna is filiform. 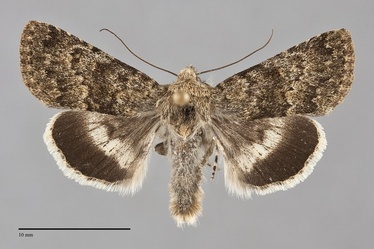 This species can usually be identified without difficulty because it is one the only alpine Sympistis species with a brown forewing and banded hindwing. The type locality of Oncocnemis pudorata Smith is British Columbia. This species appears to be rare and sporadic in and near rocky alpine tundra in the northern Cascades and Rocky Mountains. An outbreak of this species occurred at Gott Peak in the early 1990's. It was almost never encountered again at this location during the ensuing two decades. This species occurs in the mountains of southern British Columbia and northern Washington. The southern limit is the northern Cascade Range in Okanogan County, Washington. This species has been found in the Rocky Mountains of western Alberta outside of our area. No information is presently available regarding larval foodplants of this species. The most likely larval host is beardtongue (Penstemon spp.) in the Scrophulariaceae based on the preferences of related species and availability of this plant in the rocky alpine habitat where S. pudorata is found. This species flies during the summer and has been collected in July and August. It is nocturnal and comes to lights. Occasional specimens fly during the day.